One of the safest and most effective ways to remove lead paint is to use a chemical paint stripper. The EPA certification programs do not provide any training on the use of chemical paint strippers, but both EPA and OSHA list chemical stripping as an acceptable method of reducing exposure to lead dust. Chemical stripping is the preferred method of paint removal by many professionals where the surface needs to be protected such as historic restoration and boat bottom repairs. Avoid methylene chloride. A common paint stripper is methylene chloride, which is toxic and dangerous. When it combines with lead paint, poisonous lead fumes are created. The EPA and many consumer and environmental groups recommend steering clear of methylene chloride. Safe and Effective. Several alternatives exist that are industrial strength, non-toxic, and biodegradable. They might take longer to do the job, but the best lead paint removal method will balance safety and effectiveness. Thickness. To help contain the lead paint waste and make clean up easier, choose a thick stripper. These strippers will be described as a gel, semi-paste, or paste. Thicker strippers will adhere better to vertical surfaces and usually have a larger coverage area. Chemical Containment. The ideal paint stripper for lead paint removal will contain a special additive that reacts with the lead at the molecular level rending the lead paint non-hazardous for disposal. 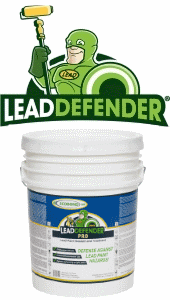 This is the safest removal method possible as it creates a chemical containment of the lead so that it does not leach out of the paint waste and into the surrounding environment. You may encounter lead paint throughout a residential or commercial building, on furniture, industrial equipment, pipes, or boats and other marina equipment. Your goal may be to permanently remove the lead paint for safety or historic restoration or some other purpose. Different tools and removal methods may be appropriate for different scenarios, and you should include chemical paint strippers in your repertoire of lead paint removal methods. The right tools will help you become more effective and improve safety, which is essential on any lead paint removal job. Although paid advertisements appear on LeadSafeList.com, the Publisher (Barrett Concepts) does not endorse the advertised products, services, or company, nor any of the claims made by the advertisement. Please refer to the advertisers website for clarification on any claims made about their products and/or services.